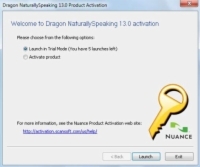 If you wonder how NaturallySpeaking 13 maintains a 99 percent accuracy rate, the secret is in the user profile. The profile learns your unique speech patterns and word choices. But, as with any good assistant, you need to provide NaturallySpeaking with clear, accurate instructions for it to follow. 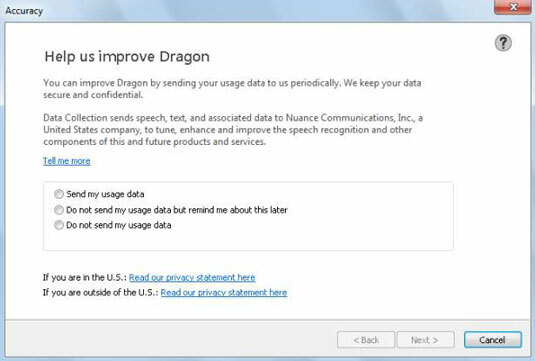 When Dragon is installed, you will see the Naturally Speaking icon on the desktop. 1Double-click the icon on the desktop (or on the Start screen in Windows 8) or choose Start→All Programs→Dragon NaturallySpeaking 13.0 from the Windows Start menu. The first time after you install the program, you will be asked to activate your software. You can activate it immediately (Activate Product) or within five more uses (Trial Mode). Activation is required to use the program after the fifth use. If you click Activate Product, you must be connected to the web in order to verify that you are using a valid serial number. No personal information is sent. If you choose to activate later, you will be prompted each of the next five times you use the software, so activate the product and avoiding the persistent reminders. 2Select the Activate Product option. Your serial number will be displayed. Another welcome screen is displayed. You’re another step closer to greater productivity and hands-free dictation! If you’re a new user who doesn’t have a user profile from a previous version of NaturallySpeaking you will be prompted to create a profile name. This name will appear on future lists and menus so that you can tell NaturallySpeaking which user you are. Pick a name you will recognize as your own. Be aware that your username is case sensitive when you make a choice. If you type your name as Tom with a capital T, you won’t be able to use tom later. After you create a profile name, you’ll need to step through the user profile options. 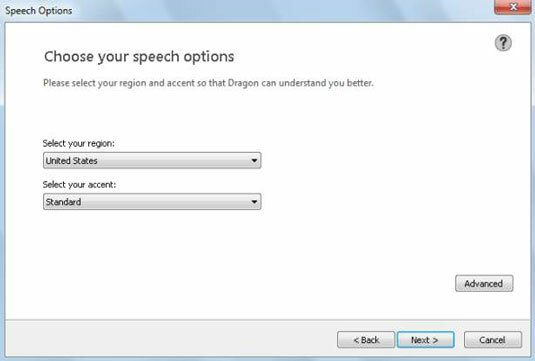 Select your region: It’s important for NaturallySpeaking to prepare files that are specific to your region of the world. Choose your region from the pull-down list. Nuance has improved the Canadian vocabulary. If you choose Canada as the region, the software uses the Canadian spelling of certain words rather than the U.S. English spelling, such as centre instead of center. Select your accent: There really are identifiable accents depending on where in the world you first learned to speak. Choose an accent from the pull-down list. 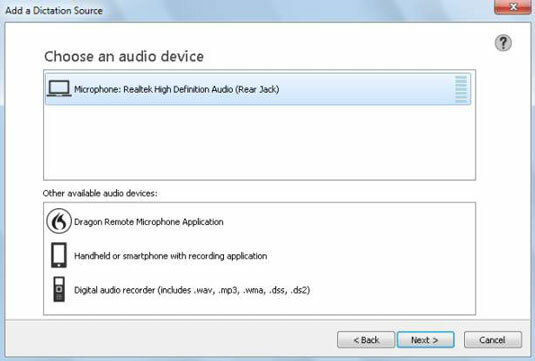 If the program can locate your microphone, it will show up in the first audio device box. If you want to choose a different audio device, double-click it in the second box. You will be shown how to position your microphone correctly. This instructional screen requires no information from you. 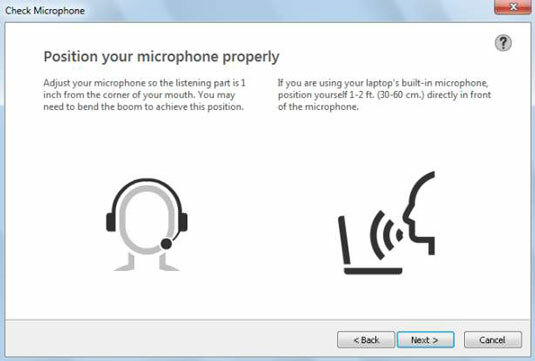 It gives you advice on how to position your microphone and shows two graphics illustrating the approved techniques. You only have to set up your user profile one time. However, there are other user profile options, including adding a dictation source to an existing profile. 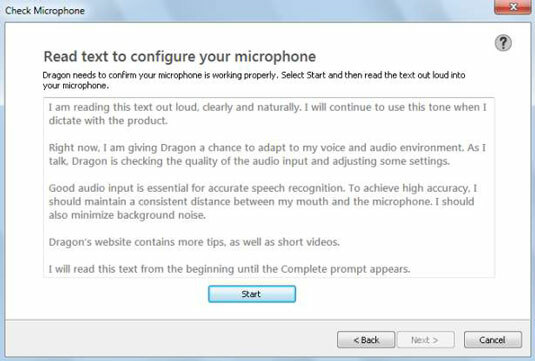 Now you need to read a bit of text to make sure your microphone is configured correctly. 9When you are ready, click Start. Begin reading until you get an audio signal that the recording process is complete. A Complete button will also appear indicating you are finished if you have the speakers muted on your system. You see a screen that lets you know that the program is customizing itself for you. When the customization finishes, a screen comes up asking you to choose whether you want to help Nuance improve the software5. Make your choice. 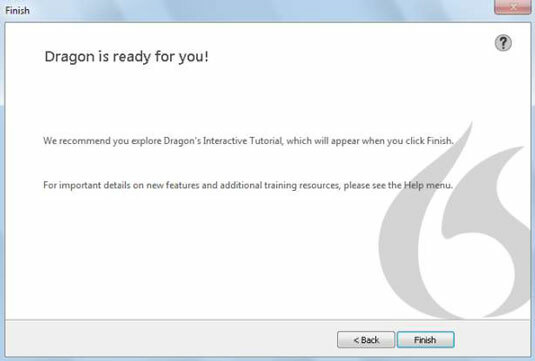 You see the bright shiny new DragonBar, and an Interactive Tutorial. 13Click the Next button to start the tutorial. If you don’t have the time to go through the tutorial now, you can always access it later from the Help menu in the upper-right corner of the DragonBar. When you’re learning, it’s great to use as many different modes as possible: watching, hearing, and, in the case of this book, doing it step by step. 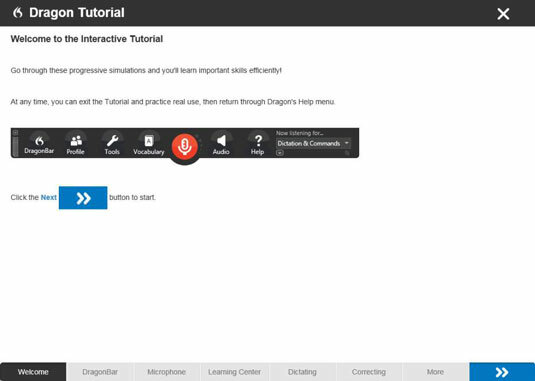 The Interactive Tutorial is also available in the Learning Center, which was previously known as the Dragon Sidebar. If you select the Interactive Tutorial, you’re provided interactive instructions on how to do things like control your microphone, dictate text, make corrections, and more. 14If you choose not to go through the Interactive Tutorial at this time, click the ‘X’ in the upper-right corner. You are then presented with the Learning Center. 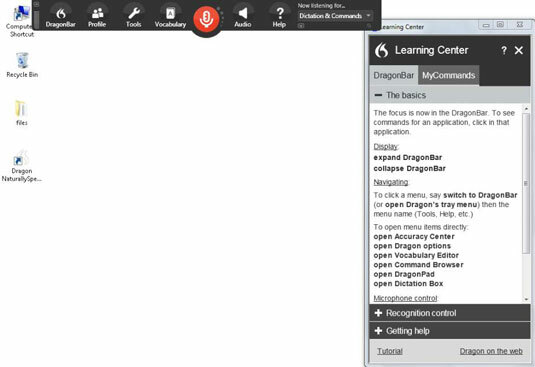 You will see the Learning Center each time you open NaturallySpeaking. Dictating: The commands you speak to the software to achieve the desired result. Navigating: The commands you speak to move around in Windows or a specific application. Editing: The commands you speak to fix the mistakes you made while dictating. Controlling: The commands you use to navigate the features and functionality of the microphone and the mouse. You’ll find all the commands for each category by clicking that menu item. The Learning Center’s focus will change when you switch between different applications. For example, you’ll notice when you’re in Microsoft Word that you see commands relevant to that application. The same goes for other common applications, such as Microsoft Outlook, Internet Explorer, and several others.